Let’s just put that out there right now. Axel and his best bud Minibobafett! And something else that Axel loves, is hanging out with his Mandalorian Merc family. After costuming with the family for a few years as a little Jedi and then taking up Ezra, Axel really wanted to be a Mandalorian. So doing a young Boba Fett seemed like the PERFECT fit. Similar Ezra hair, bounty hunter scowl, and Axel would do it perfectly! So we set to work on making sure Axel could take his rightful place standing proud with his Mercs! 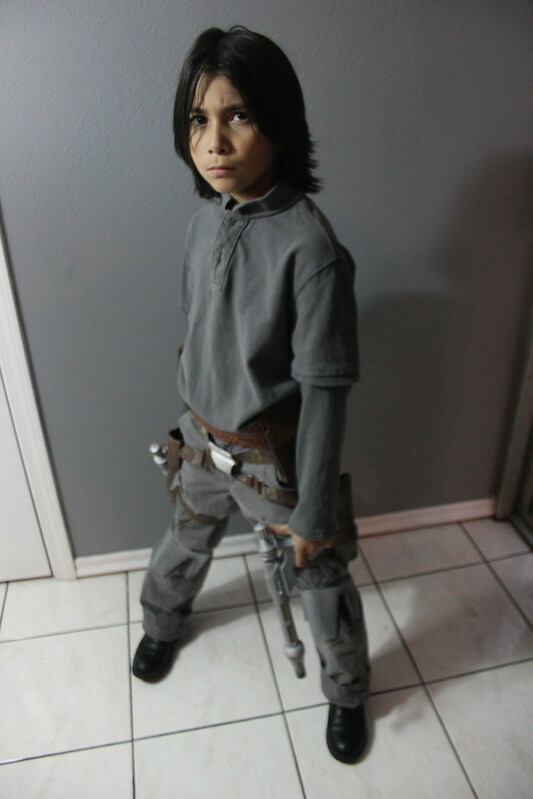 For this costume I pulled every screen and pic I could find of Boba Fett from the Clone Wars Season 2 Episodes R2 Come Home and Lethal Trackdown. Bonus: I got to watch these episodes over and over for a month or so. Unlike the Star Wars Rebels costumes that we created BEFORE the show aired, this was SO much easier to get good reference shots!! All that in hand my list came together pretty easily! So I began the next step the way I usually do. Hitting up thrift stores and grabbing whatever I can there first! All rounds done I found 2 shirts to turn into the top piece and grey pants for the bottom. As cool as jumpsuits look, I have to say they can be difficult to wear. Especially for a kid who might be in costume all day and at some point may need to use the restroom. The next Ezra costume I make for him will definitely NOT be a jumpsuit. I also got a pair of black boots that worked. I also bought the Rubies Holster with Westars just to get the pistols but ended up thinking I could re purpose the actual holsters themselves. Also had found a brown womens belt to use for the girth belt, foam, and fabric for the poncho and armor pieces and was ready to finish it! I bought foam and cut and shaped it to make the Mandalorian knee armor. Then I attached the Velcro and strapping to attach the knee to the pants and keep it in place. Luckily for me and my extremely limited sewing skills, a poncho is one of the easiest things to make. Cut out the basic shape from the fabric, then sewed the yellow stripe onto it. Instagram tease pic makes for bad build pic later. I ended up misting the edged with black, grey, and brown spray paint to weather the fabric. The girth belt is pretty much ready but the holster needed to be resized. I cut it apart and placed snaps to connect all the pieces together. I also repainted the lame Rubies paint job with a better more leather looking weathered brown. Also the belts do a great job of covering the seam where the shirt tucks into the pants. Of course NOW I have to rebuild the holster because kids grow… for some reason. So it all came together and Axel was ready. And he is always happy when he joins his fellow Mercs. And Boba should keep his father’s helmet with him…. Previous Post Star Wars Geek Girl Podcast Episode 56 The Sabines Kick Off the New Year!